1. Cut a piece of bread in the shape of a circle. 2. Dab some peanut butter and spread on the bread. (use only enough that you can barely see the peanut butter - that reduces choking a lot). 3.Take a banana and slice off a thin piece and smash it. Then spread over the peanut butter. 4. 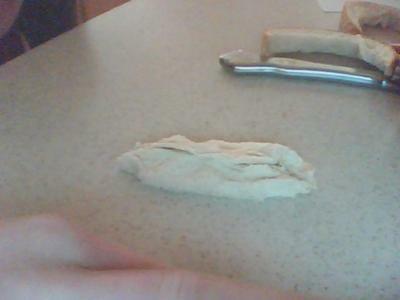 Then take a pinch of oat (like oatmeal oats) and spread it over the banana spread. 5. Then fold (the picture at the top is what the finished product looks like).